Back in September, Google came out of nowhere with Chromecast Audio. The idea: take the Chromecast concept (tap a button, send a video to your TV and control it from your phone) and make it audio-only, letting you add some Wi-Fi-enabled smarts to any stereo system you’ve already got wired in your house. It had one big weakness, though. Unlike something like Sonos, you could only play a song on one Chromecast Audio at a time; even if you had Chromecast Audios throughout your house, you couldn’t play things in multiple rooms simultaneously for that lovely full-house sound. Today that changes. Chromecast Audio now has multi-room support. Starting a multi-room setup is a little different than with Sonos, which focuses on making it easy to make/break groups on the fly. 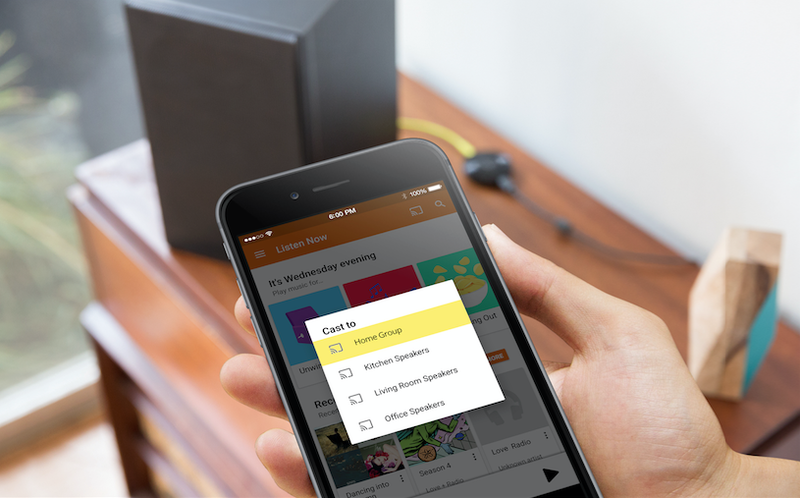 With Chromecast Audio, you set up your groups in advance. You can have a “Whole House” group, and a “Kitchen Speakers” group, and a “Downstairs” group. To start an audio group with Chromecast Audio, you switch from whatever app you’re using over to Google’s own Chromecast app temporarily, create the group, and then pop back into the other application and cast to the new group. Okay, Google: now add this to the standard Chromecast, so I can play the same thing perfectly synced on multiple TVs without wires so I can feel like a futuristic space wizard. Meanwhile, Chromecast Audio also got support for a higher resolution audio stream: it can now handle audio up to 96KHz/24bit lossless, which is mind-blowingly good for a wireless standard — better than CD quality, even. It won’t magically make a crappy pair of speakers sound great, of course — but if you’ve got high-end speaker gear in your home already, Chromecast Audio can now keep up.